Holiday Reading: “Dancing in Their Heads,” on The Nutcracker and the production of girlhood. By Gregory Weatherford. Chances are that the next weeks will bring a bit of Nutcracker into your life. We offer some perspective with Gregory Weatherford’s article about a troupe of ballerinas on the cusp of womanhood, competing for roles in the famous ballet about the hard-jawed hero. Most of the ballerinas are girls between the ages of ten and thirteen. These are, to put it gently, not easy years to be a girl. They’re growing, or not, they’re getting gangly or getting bulky, they’re getting figures, or not. They’re on the cusp of everything. First published in Richmond, Virginia’s Style Weekly in 2002, when The Nutcracker was due for an overhaul, this article gives a glimpse into the constant performance of girlhood and the sometimes reluctant transition to bigger roles. Read about what’s at stake in the excerpt below. Or click here to enjoy the full article, specially formatted for online reading. 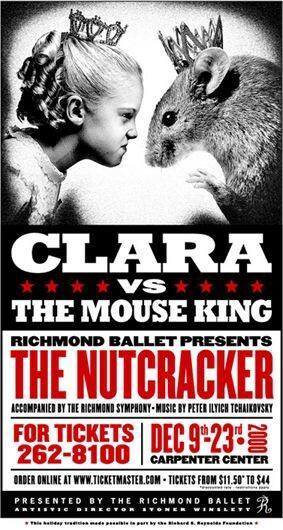 … There are about 120 children in [Richmond Ballet’s] The Nutcracker every year. Most of them are girls between the ages of ten and thirteen. So life lessons can come from anywhere. Sometimes they come from a 122-year-old ballet about a little girl who has a dream. During The Nutcracker, they learn all kinds of things. Professionalism. Hard work. The power of art and of beauty. The other girls nod agreement. They are silent for a moment. eries of full rehearsals before opening night. Every one of the sixteen girls in this gaggle wants to be Clara, whose dream the ballet depicts. “A girl cried last year during tryouts,” says a girl. “It’s just a big deal,” says another. They all nod, soberly. Greg Weatherford has been a reporter, features writer, and news editor in Virginia for a quarter century, and he is one of Broad Street’s founding advisors. He’s seen some Nutcrackers in his day. Previous postContributor News: Deborah Jiang-Stein honored at L'Oréal's "Women of Worth" event. Next post2017 in Review: “Unite with Love, Resist with Love,” and the evolution of a politically motivated painting. By Jonathan Machen.